BANGKOK, 27 March 2018 (NNT) – The Royal Thai Armed Forces are cooperating with the national road safety facilitation committee to keep Songkran holidaymakers safe on the roads and to bring down casualty numbers across the country. During an assembly of the Defense Council, Deputy Prime Minister and Defense Minister Gen Prawit Wongsuwan assigned chiefs of all defense units as well as the four armed forces to work in support of the national endeavor to foster road safety and protect citizens from road accidents during the Songkran holidays this year. To this end, the officials were instructed to coordinate with the road safety facilitation center in every province to intensify traffic law enforcement, campaign for public awareness of road rules and etiquette and provide convenience for road users during the seven-day Songkran period from April 11-17. In addition, the Deputy Prime Minister reminded all military members to strictly follow the law while behind the wheel so as to set a good example for civilians. He also suggested security units step up intelligence cooperation with civil networks during the festive period in a bid to prevent any untoward incidents from happening. The same as last year and the year before. Cynical as I am, I expect this 'new initiative' to fail like all the other 17, I have seen. Deputy Prime Minister reminded all military members to strictly follow the law while behind the wheel so as to set a good example for civilians. They drive like they own the road displaying their uniform conspicuously to intimidate other users. They do own the roads, along with everything else. 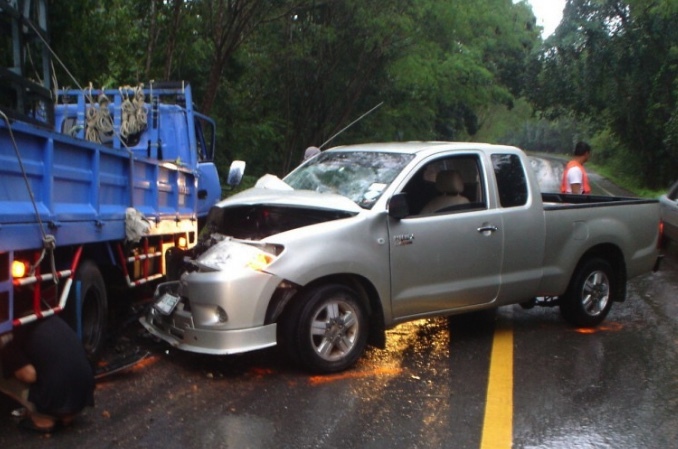 "The Royal Thai Armed Forces are cooperating with the national road safety facilitation committee to keep Songkran holidaymakers safe on the roads and to bring down casualty numbers across the country." They're going to park tanks across all the highways to prevent vehicles getting passed. That will lower the casualty numbers for sure. In addition, the Deputy Prime Minister reminded all military members to strictly follow the law while behind the wheel so as to set a good example for civilians. Coming from a man who sets such good examples himself! two main problems , the traffic laws should be enforced all the time, a very large percentage of Thais do not know how to drive , either according to the road conditions or there brain power, although if that was the case there would not be many vehicles on the road. Ole fatties spouting nonsense again. So they are banning all traffic from the roads, well that is the only way to stop the carnage. Asking people to drive safely/ correctly/ considerably is never going to happen. Only time I saw the military on the road, was in a convoy of about 20 trucks that followed so closely together that no one could pass and drove slowly. Need I point out the consequences? They are poised,to help,and no doubt will remain poised during the whole thing. Although they still allow people to sit in the back of pickups. In the above picture they would have been catapulted into oncoming traffic.